left to right: Guest moderator Rhonda Whitaker, Duke Energy; Dr. Jim Detwiler, Boone County Schools; Barbara Stewart, Northern Kentucky Workforce Investment Board, Janice Urbanik, National Fund for Workforce Solutions discussed the regional workforce at a recent NKY Chamber Eggs ‘N Issues. Recently, Barbara Stewart, Director of the Northern Kentucky Workforce Investment Board, was a panelist at the Northern Kentucky Chamber of Commerce monthly Eggs N’ Issues focused on the new initiative, GROW NKY. Rhonda Whitaker, Government & Community Relations Director for Duke Energy Kentucky, Chamber Board Chair and panel moderator, initiative overview detailed how GROW NKY will examine regional high demand sectors to determine their workforce issues and needed changes to the local talent pipeline. 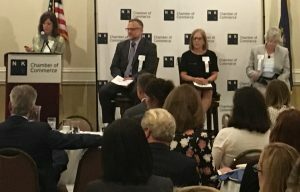 The panel of regional workforce experts emphasized the importance of internships and apprenticeships, professional skills training for job seekers, and employers looking beyond high school and college students for their workforces. The panel also responded to audience questions including how to solve the absence of skilled job seekers in the local workforce pipeline.